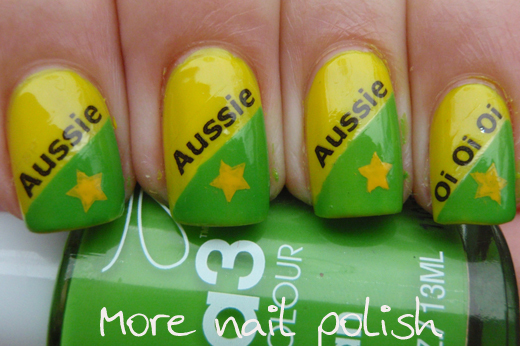 Here is mani #2 in the lead up to Australia Day this week. I still can't believe I did these nails. They are so bogan it's funny! I'm not sure how well known this chant is outside of Australia, but every Aussie will be familiar with "Aussie, Aussie, Aussie, Oi, Oi, Oi". I remember hearing it for the first time as we were herding ourselves out of Sydney Olympic park after the end of a days competition during the 2000 Olympics. I used three coats of Ulta3 Frangapani with a coat of Seche Vite to try to hurry it up drying so I could apply some tape. I then taped the diagonals and had to do two coats of Ulta3 Tahitian Lime to get it opaque. Next I applied the text which I again made using water decal paper. 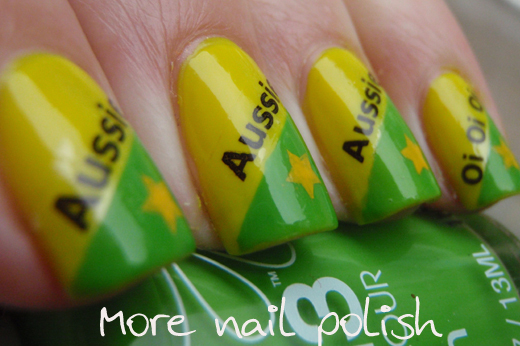 Finally I added a yellow star using konad special polish in yellow and a star from my ENAS stamps. I'm so happy with how these turned out, I really don't want to take them off tonight to put something else on. I got quite a lot of comments today on these. Mainly people asking where I got them done, so it's a nice feeling to tell them I did them myself and seeing their reaction. 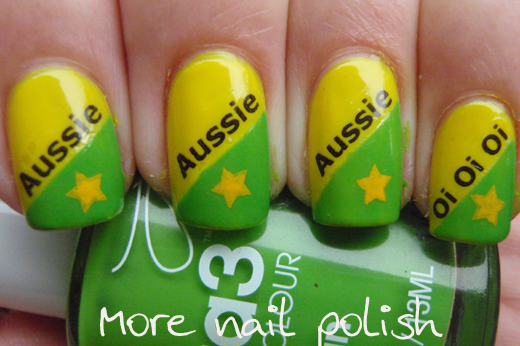 Awesome job and very Aussie! No wonder you don't want to take them off. Thanks. I might leave the right hand on a just change my left hand. So funny!! I like them a lot!! They made me giggle too. I love them!!!! Don't take them off! Thanks, I even surprised myself with these! I think I keep the right hand on. This is really grat, good work!! Thanks, I was really happy with it. Wow that looks great! You make great water decals! The water decals are so easy, just print, seal and slide. Thanks, normally my nail art is sloppy, even I can't believe how neat they were. Even my tape mani part was the neatest I've ever done. Where do you find the decal paper? ebay - search "water slide paper". I got the clear inkjet paper, you just need to seal it before putting into the water. I just put a layer of top coat on the paper. Never thought to put a layer of topcoat on the decal paper. I have yet to use my paper but I will now.. excellent job! I love this! 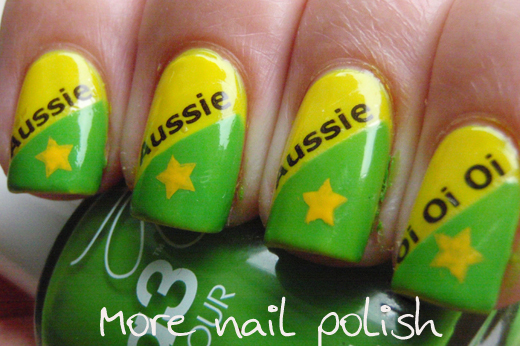 Very patriotic, not bogan!!!! !